Indofood Instant Seasoning for Vegetable in Coconut Stew in 0.8oz (25g) sachet. 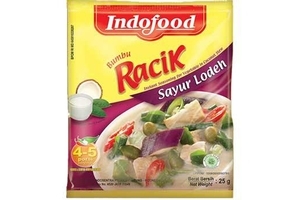 Bumbu Racik Sayur Lodeh Indofood lengkap dengan bumbu dan rempah rempah siap pakai. Sayur Lode is a variety of vegetables are simmered in a milk coconut milk curry to make this popular Indonesian side dish. Serving 4 - 5. Product of Indonesia. Halal Certified حلال . No Preservative ≠ | No Coloring ۾∞ | Halal Certified حلال . Bumbu Racik Indofood is produced from real spices and seasoning, all of which have been dried without added preservatives or coloring. Its practical usage keeps you from doing any unnecessary preparations and also keeps your kitchen clean. With Bumbu Racik, everyday meals can be cooked more practically, faster and also more economically. All you need to produce is some ingredients and Bumbu Racik Indofood’s lineup of variants will take care of the seasoning to prepare for the most authentic, healthy and tasty home-cooking… as tasty as your own! Ethnicity: Asian, Chinese, European, Filipino, Indonesian, Japanese, Malaysian, Singaporean, Spanish, Taiwanese, Thai.